Applicants who are in good standing at their previous institution may be accepted in good standing. Applicants who wish to transfer to the College must meet the entrance requirements and follow the guidelines listed in the “Program Requirements/Admission Procedures” section of the Ogeechee Technical College Catalog and Student Handbook. Applicants who have been previously enrolled at a postsecondary institution and desire entrance into one of the competitive admission programs (Diagnostic Medical Sonography, Echocardiography, Practical Nursing, Radiologic Technology, or Surgical Technology) must meet certain specific requirements listed in the Ogeechee Technical College Catalog and Student Handbook. Criminal Background Checks and Drug Screenings are not transferable. This policy guides all advanced placement activities at Ogeechee Technical College. Advanced placement allows a student to receive course credit based on previous experience, formal or informal, and results in advanced standing within a certificate, diploma, and degree program. Ogeechee Technical College does not award academic credit for course work taken on a noncredit basis. Students may be eligible for advanced placement through two methods: Transfer Credit and exemption credit. Ogeechee Technical College recognizes previous post-secondary coursework by accepting credits earned from other regionally or nationally accredited institutions that are applicable to the student’s program of study. A student who presents credit for evaluation and transfer must be aware that the awarding of credit does not guarantee that institutions subsequently attended by the student will accept those credits. Credit for courses received at an institution accredited by a national or regional accrediting agency recognized by the U.S. Department of Education and the Technical College System of Georgia (TCSG) and whose entrance requirements and curriculum are equivalent to or greater than those of OTC will be considered for award of transfer credit. Credit may be granted for formal military schools, training and correspondence courses in accordance with the American Council on Education. Ogeechee Tech recognizes that it is necessary to establish reasonable and definitive policies for accepting transfer credit. The College developed these guidelines in accordance with the standards set by the American Association of Collegiate Registrar’s and Admissions Officers. Ogeechee Tech distinguishes between the acceptance of credit and the applicability toward program requirements. Applicability of credit toward a credential refers to the prerogative of the academic divisions to count specific credit toward fulfillment of graduation requirements. The Registrar determines the transferability of courses taken at other post-secondary institutions by considering the educational quality of the learning experience for which the students seeks transfer credit; the comparability of the nature, content, and level of learning experiences to the courses offered at Ogeechee Tech (the course is essentially the same content as the course to be taken at the College); and the appropriateness and applicability of the learning experience to the programs offered at Ogeechee Tech and how recently the occurred. In order for the Registrar to evaluate credit, the students must submit official transcripts from colleges to Ogeechee Tech. All official transcripts must include final grades. Students may receive transfer credit for courses for which they earned a C or better. The Registrar will not award transfer credit with grades below a C, including D, F, I, IP, W, WF, and WP. Due to the rapid changes in technology and technical information, program-specific courses will be considered for transfer credit in a program only if the coursework has been completed within the past five years (60 months). Technical courses that were taken five years prior to admission to Ogeechee Tech will be evaluated for technical currency for course content by the program faculty. A student desiring consideration of credit for technical courses or experiences that are more than five years old can request transfer by exemption testing. Transfer credit will be considered without restriction of completion dates for those courses in academic disciplines. Examples of these courses include, but are not limited to, English, psychology, mathematics, physical sciences, natural sciences, and social sciences. The Registrar will not award transfer credit for learning support coursework or other institutional courses such as college orientation courses taken at other colleges. The transfer credit is recorded as TRA, TRB, or TRC on the Ogeechee Tech transcript and is not included in the calculation of the semester, cumulative, or graduation grade point average. The third letter indicates the actual grade earned in the course. For competitive admission programs, grades for credit earned as transfer credit will be evaluated for GPA and calculated in the GPA under consideration for program admission. Students may access their records online through the College website via BannerWeb to verify the transfer credit awarded by the Registrar. If coursework is earned at a nationally accredited college, Ogeechee Tech reserves the right to evaluate instructor credentials applicable to the requested transfer coursework. A student who has attended a previous college and is eligible for transfer of credit for English and math is not required to take the COMPASS placement exam. However, if the student for any reason takes the exam and scores indicate the need for a learning support class, the student forfeits evaluation of their transcript and the scores on the exam will determine placement, except in the case of a competitive admissions program. Students wishing to transfer from Ogeechee Tech to another college must contact that college directly to determine transfer of credit. Are you wondering what courses you have taken at a previous college will transfer to Ogeechee Technical College? The Georgia Transfer Articulation Cooperative Services (GATRACS) is a partnership between the University System of Georgia, Technical College System of Georgia, Georgia Department of Education and the Georgia Student Finance Commission. 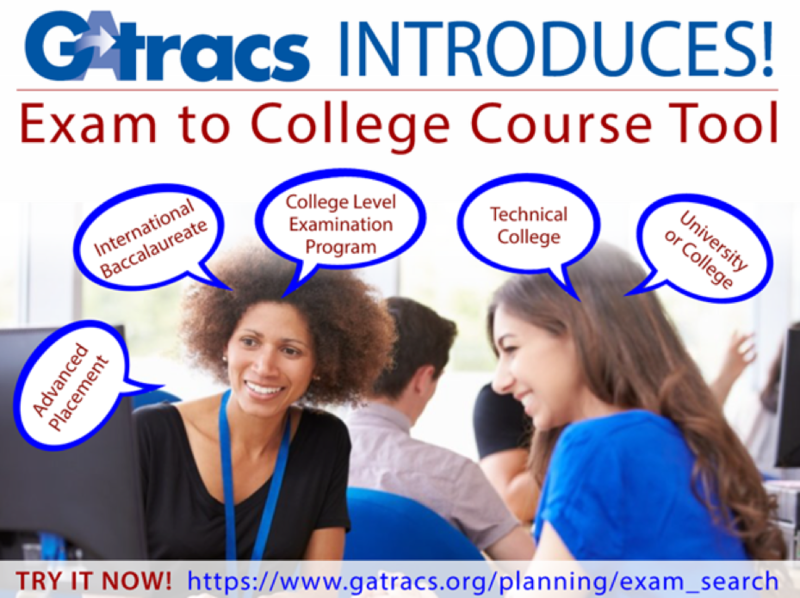 GATRACS objective is to improve information on articulation opportunities and course transferability in the State of Georgia. The project is funded through the College Access Challenge Grant. Go to www.gafutures.org to set up an account. Credit may be awarded for education/training experiences in the Armed Services. Such experiences must be certified by the American Council on Education (identified in the Council’s publication: Guide to the Evaluation of Educational Experiences in the Armed Services) or the official catalog of the Community College of the Air Force or a similar document. The experiential learning will be evaluated by the program instructor along with the Registrar to determine the course competencies. Credit will be given on the basis of individual evaluation. Course information must be present on the Armed Forces transcript. Credible military experience must closely correspond to the course(s) in the Ogeechee Tech curriculum content and competencies. The time limit specified in the transfer credit section also applies to the experiential learning. Ogeechee Technical College considers credit awarded for non-collegiate educational programs as recommended by the American Council on Education (ACE). ACE’s National Guide to College Credit for Workforce Training and National Guide to Credit Recommendations for Non-collegiate Courses contain recommendations for experiential learning and professional examinations or certifications offered by other organizations separate of postsecondary educational institutions, including agencies offering professional certifications and the military. Documentation is required. The faculty member of the program in which the student is enrolled evaluates the documentation to determine if the experience meets or exceeds the program/course standards and makes a recommendation to the Registrar only if sufficient documentation is provided. Final determination is made by the Registrar. The process ensures all course work and outcomes are at the appropriate collegiate level. Credit may be awarded based upon an evaluation performed by an independent evaluation service. Recommended evaluation services are available in the Admissions Office. The Registrar will make the final decision regarding the award of transfer credit. Grade points will not be assigned to transfer credit. Articulated Credit is an option that allows high school students to receive advanced placement or exempt courses by taking articulated courses in high school. The student must submit a high school transcript showing the completed courses the student wants to receive credit from. Ogeechee Technical College must validate student competencies before awarding articulated credit for competencies learned in high school by administering the final examination/exemption examination for the course to be articulated. No fee shall be charged to students taking an exam to validate articulated credit from high school. The student must score equal to or higher than the required scores for the courses. The College shall bank credit after a high school student successfully passes the exemption exam required to articulate subject credit. This credit shall be applied to the student’s record once he/she matriculates to the College. The high school student must matriculate within 2 years after high school graduation, unless dictated by programs standards. A list of approved courses is available from a high school counselor or the Admissions Office. Ogeechee Tech will honor local articulation agreements statewide when students move from one area of the state to another and will validate the credit by administering the final examination/exemption examination for the course being transferred. Articulated credit awarded will be indicated on transcript/permanent records by use of the letters "AC." A student may receive credit for courses by passing an exemption examination only if the student has never attempted the course nor made a grade of D or F in an equivalent course at OTC or another postsecondary institution. A student cannot withdraw from a course and register to take an exemption examination within the same term nor can a student take an exemption examination if he/she is currently registered for the course. Earn a score of at least a “C”. For competitive admissions programs, grades for credit earned by exemption exam will be evaluated for GPA and calculated into the GPA under consideration for program admission. The examination will be taken during the week of final examinations unless otherwise approved on a case-by-case basis by the appropriate Academic Dean. A grade of “EXE” will be entered on the permanent record if the exemption exam is successfully completed. The hours for the exempted grades will not be computed in the grade point average. Exemption exams may be taken twice and must be a course or elective in the student’s program of study. NOTE: The Academic Affairs Division determines which courses exemption exams may be given for. A list of courses is available in the Office of the Vice President for Academic Affairs. Academic Affairs reserves the right to change the courses on this list at any time and without notice. Find out which institutions in Georgia accept your exam scores for college credit. The Exam to College Course Tool allows users to select an exam type and title, then select different colleges to find out where their exam score may be accepted for credit. Ogeechee Technical College requires that a minimum of twenty-five percent (25%) of the coursework of a particular program of study be completed at the College in order to be granted an award.